The defeat of 1967 brought about a huge shock in the Arab world. Deep feelings of humiliation explain why on 1 September 1967, at the following summit of the League of Arab States in Khartoum (Sudan), a resolution was passed in which the member states declared three No’s: no peace with Israel, no recognition of Israel, no negotiations with Israel (see for more in depth information June War of 1967 in Arab-Israeli Negotiations). 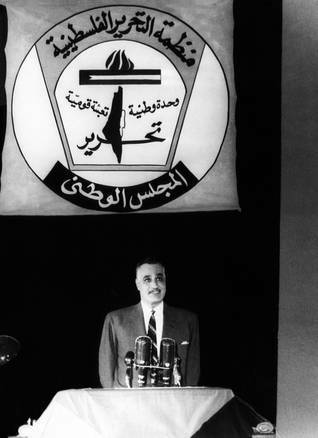 Three years earlier, under the auspices of the Arab League, an Arab summit meeting in Cairo had led to the establishment of the Palestine Liberation Organization (PLO), a political umbrella organization of most of the Palestinian groups. Its first leader was Ahmad al-Shukeiri, a lawyer and former member of the Ottoman Parliament, and a former assistant to the Secretary General of the Arab League. In the PLO gathered the oldest and most influential of the Palestinian guerrilla organizations, the Palestinian National Liberation Movement or Fatah, together with smaller groups such as the Popular Front for the Liberation of Palestine (PFLP), the Democratic Front for the Liberation of Palestine (DFLP), the PFLP-General Command (a splinter group of the PFLP) and the Palestine Liberation Front. In all, the PLO included more then ten groupings. Its charter, the Palestine National Charter, stated as its goal the destruction of the State of Israel, the total liberation of Palestine and the establishment of an independent Palestinian state. 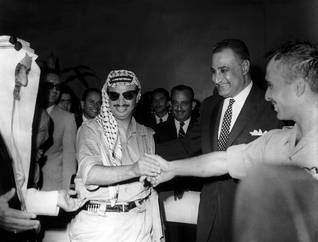 At the beginning of 1969, the June War ultimately lead to a take-over of the PLO from within by the Palestinian member organizations, which had lost confidence in the policies of the Arab states with regard to Israel after the 1967 defeat. As a result, the PLO could now be regarded as the true representative of the Palestinian people, with autonomy of decision. Yasser Arafat, the leader of Fatah, became its new chairman.